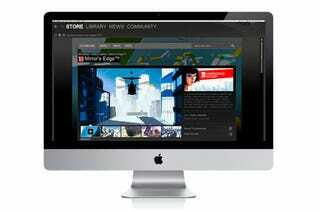 Is Valve Bringing Steam To The Mac? Yesterday's announced update to Valve's Steam digital distribution service came with a surprise—hints that the Half-Life developer may be planning to add Mac OS X support to the currently Windows-only software. Steam forum members dug through newly released files from the recently launched open beta and dug up a handful of Mac OS X-specific graphics, like the open, maximize and minimize jewel icons that are used in the operating system's windows. While those icons could be chalked up to Steam's change to a WebKit-based rendering engine for the client—Valve has moved away from Microsoft's Internet Explorer for Steam's new UI—there are a few other Mac-specific graphics buried within. That includes system dock graphics and a handful of OS X menu files. While the current Steam library is Windows only, many of Valve's publishing partners, including EA, Take-Two Interactive, PopCap Games and id Software, publish Mac versions of their games, a potential audience whose needs are not being met by Steam. We've reached out to Valve to see why the developer has added OS X graphics to Steam and if that means support for the Apple crowd, but have not yet heard back.